Muscari are an easy to grow spring flowering bulb best planted in groups. Attractive flowers and good foliage they take up little space and a small clump of these spring flowering bulbs does deserve a position in many gardens. 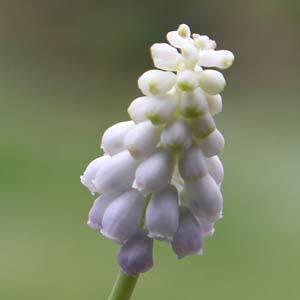 A fragrant plant with grape like flowers hence the name ‘grape hyacinth’ ranging from white, Muscari botryoides album through to blue, mauve and purple M.armeniacum and M. plumosum. Note that M. plumosum has a feathery plume of mauve flowers. The two toned M. latifolium is an interesting form with a blue top and purple bottom section to the flower. Other Muscari varieties to look for. Muscari argei – Very attractive white flowers that add a little variety and contrast to the garden. Flowering in late winter. Muscari macrocarpum ‘Golden fragrance’ – Golden yellow flowers that look a little different to the normal Muscari flowers. It is perfumed when in flower, a sweet and attractive fragrance. Muscari neglectum – Deep blue flowers darkening towards the base of the flower stalk. A vigorous very form. Well drained soil rich in humus, sunny position, plant bulbs at around 6 – 8cm deep. Muscari will also do well in pots. Feed bulbs after flowering. Soil – Humus rich well drained soil. Watering – Only required if you receive a very dry spell during active growth. Fertiliser – Top dress with blood and bone in winter. Apply a general all purpose bulb fertiliser in spring.